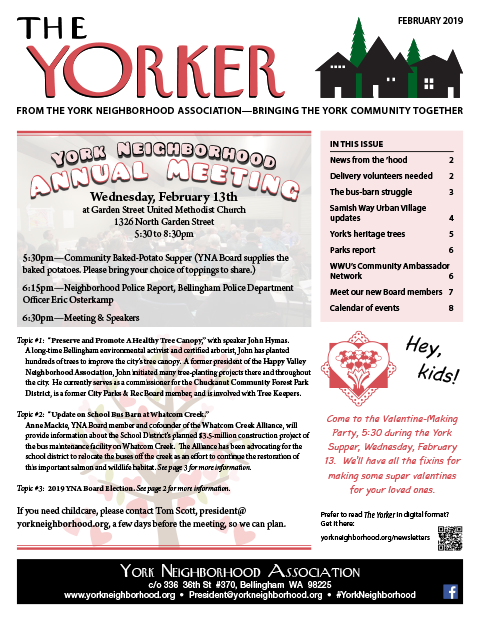 Welcome to the York Neighborhood Association Website! 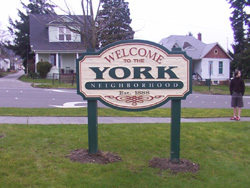 The York Neighborhood Association (YNA) exists to preserve and enhance the community and engage citizens in civic affairs. We work to promote a safe, comfortable, and thriving urban neighborhood bordering downtown Bellingham, Washington. As a neighborhood, we are involved in planning for the future, historic preservation, traffic and pedestrian safety, social events, and park improvements. If you live or work in the York Neighborhood, we hope youll get involved! Use our contact page to subscribe to the YNA List and indicate other interests. The Yorker newsletter (February 2019). Pot Luck fixns from attendees! The York RATS pick up litter and cans to keep our neighborhood clean! Join us every other Saturday at 8:30am in front of Nelsons Market. Contact: Looking for a new lead! If you have a presentation you would like to give or a question to place before Yorkers and neighbors, we would love to hear from you. Please contact our President (Mark Sherman) or Vice President (Tom Scott), and we will discuss opportunities. Please note meeting time can be limited, and contacting us well in advance really helps us allocate time for your topic.